The open-source nature of the Android platform is its biggest strength and Achilles heel at the same time. Android handsets constituted almost 72% of global smartphone sales in Q3 2012 and 1.3 million Android devices are activated worldwide every single day. 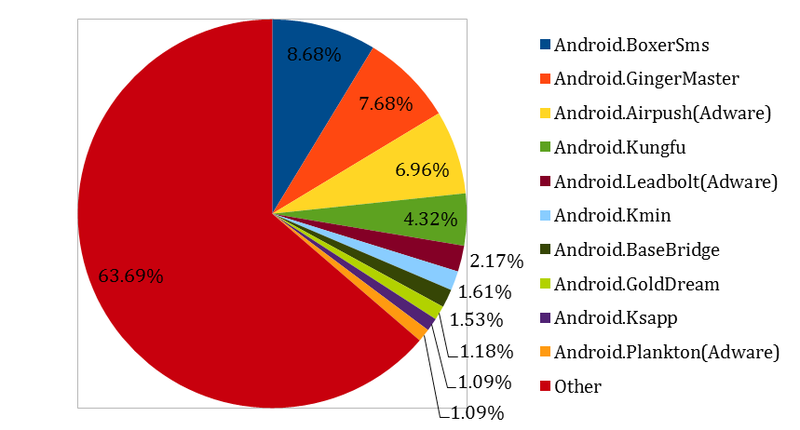 This is a staggering market share that Android enjoys but this brings with it the risks of viruses, phishing attacks and other malicious software. Quick Heal’s Research & Development Center receives about 500 Android malware samples on a daily basis. Mobile malware modification saw an 80% increase in 2012 and a 30% overall growth in mobile malware as compared to 2011. The nature of these malware samples varies considerably from desktop malware since the features and functions of smartphones are in stark contrast. Smartphone users store a lot of personal data on the devices that they carry with them at all times. Unfortunately, public awareness about these aspects is still in its infancy. Quick Heal Mobile Threats Report (Global) shows that SMS Trojans accounted for 38% of all threats. 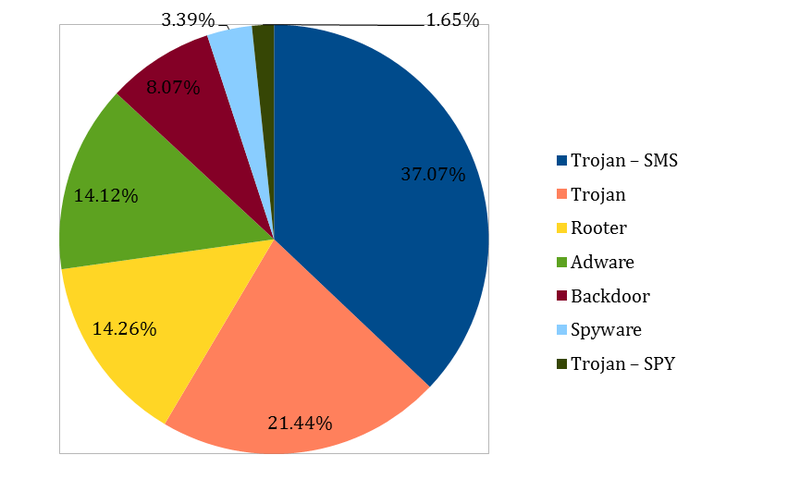 Other Trojan variations constituted a considerable 21% of all malware families. Apart from these, we also found modifications of Rooters, Adware, Backdoors and Spyware. Here is a list of the top 10 Indian Android malware that were received by our R&D center during 2012. This Trojan disguises itself as a popular app like Angry Birds or Skype and sends out messages to country specific premium-rate numbers in the background. It also poses as a defective download to fool victims into installing it multiple times. This Trojan targets Android 2.3.3 (Gingerbread) and is found embedded with fake versions of popular games. Once installed, it gains root access and sends out confidential device information and downloads other malicious applications. This adware links devices to aggressive advertising networks and displays ads at any time, especially in the notification area and in SMS messages. Airpush accompanies malicious apps and also reads browser bookmarks. Kungfu uses the GingerBreak exploit to gain root access of a device. It then traps the device in a botnet and hides itself with advanced polymorphic tricks. Once installed, it transmits crucial device information to remote servers. Another form of adware that serves pornographic advertising. In addition to sending data like operator name and phone number to remote servers, it also creates unwanted shortcuts on the homescreen of the Android device. This Trojan also transmits data like device IMEI, IMSI and other files to premium-rate numbers. It uses clever disguising tricks that utilize HTTP servers to avoid detection. Before this Trojan transmits confidential device information and location data, it locates and disables popular security suites installed on the device. It also obtains root access and drops another malicious payload (Android.Anserver). GoldDream gets embedded with legitimate game apps that are altered. Once installed it creates logs of incoming and outgoing SMS messages and calls and shares this data with remote servers. This Trojan infects a device and opens a backdoor for other malicious software. All phone details are stored on a remote website. Another aggressive adware that drops search icons on the homescreen, sets bookmarks, invades the notifications area, sets the home page for browsers and posts confidential data to remote servers. 2013 threatens to bring a monumental rise in the overall growth of mobile malware numbers and modifications. Advanced attack techniques are constantly being devised by smartphone attackers and these will soon reach the mainstream market. With such large numbers of Android devices functioning all over the world, it is inevitable that attackers target these users. In 2013, people will carry out more financial transactions through their smartphones and also store more confidential information, thus increasing the risk factor. Unfortunately, many people feel that mobile security suites make their device slow and unresponsive. This user negligence will play into the hands of attackers as it will give them an unobstructed path to target their victims. With the help of innovative social engineering techniques, malicious parties typically target Android devices with the sole intention of monetary benefits. More than 25 billion apps were downloaded from Google Play in 2012, and along with independent third-party application markets, this is the single biggest source of danger to Android device owners all around the world. With the right mobile phone security software, like Quick Heal Mobile Security, these threats can be successfully thwarted to ensure that your device and your data are completely secure. Yes both these models can be scanned using the PC2Mobile scan feature. Hope all these threats were detected succesufly and taken care for all licence holders. Yes all these threats are detected and prevented by Quick Heal Mobile Security. I am unable to scan htc Wildfire S using QH Total Security 2013 as it can’t find the device. Please help. We recommend that you download Quick Heal Total Security from Google Play. You can scan your mobile with the help of this application. Your feedback has been noted. Sometimes it takes time and cooperation from the device manufacturer to make our product compatible with certain models. We will try our best to include the aforementioned devices to the compatible list in the near future. Some viruses only target specific Android versions whereas some afflict all versions similarly. It depends on the manner in which the virus code has been written. VERY USEFULL INFORMATION.ALL INFORMATION QUICK HEAL GIVES IS VERY VERY HELPFULL.THANKS TO QUICK HEAL FOR PROTECTING THEIR CUSTOMERS. VERY USEFUL INFORMATION.ALL INFORMATION REGARDING ANTIVIRUS QUICK HEAL GIVES IS VERY HELPFUL. THANKS TO QUICK HEAL FOR PROTECTING THEIR CUSTOMERS. I HAVE BEEN USING QH FOR PAST 2 OR 3 YEARS AND I AM FULLY SATISFIED WITH IT,THOUGH I HAVE A PROBLEM THAT MY PHONE[SONY XPERIA S]IS NOT INCLUDE IN THE MOBILE SCANNING LIST THEREFORE I AM NOT ABLE TO SCAN IT.IT WOULD BE HIGHLY HELPFUL IF MY PHONE IS INCLUDE IN THE LIST AS SOON AS POSSIBLE. For newer smartphones like yours, it is recommended that you install the Quick Heal Mobile Security software. The application can be found on Google Play. I am using Quick Heal Total Security on my three systems successfully & renewed twice. I have purchased Sony Experia Neo L & purchased quick heal mobile security for that. Is it possible to use total security for mobile phone of above mentioned model? Yes you can install Quick Heal Total Security for your Android mobile as well. The application can be found on Google Play. i’m using gaurdian quikheal from past 1 year. it is safe for android and my lappy. thanks alot quicheal to protecting our gadets from viruses. I am using Quickheal anti-virus protection on my laptop. How am i to protect the same my Samsung GT-6802 mobile and Dell desk-top using the same package? I feel the above mobile is not included in your scanning list of mobile. Please advise. If your smartphone runs on Android OS you can download the Quick Heal Total Security for mobile application on Google Play. On the other hand, Quick Heal Total Security has the PC2Mobile scan feature that you can use to scan your smartphone. However, if your device is not on the compatible list, then you will need to be patient till we add support for this device as it requires time and cooperation from the manufacturer as well. If you have Quick Heal Total Security you can connect your Sony smartphone to the computer with a USB cable and run the PC2Mobile scan. Your device is supported. Alternately, you can install Quick Heal Total Security for Mobile from Google Play and scan your phone. I use quick heal on all of my desk-lap tops. But I don’t use it for my Galaxy Tab2. so far I’ve avoided any kind of financial transactions from Tab. Can I use it for such secured transactions if I use QH for my TAB & how? Thank You in advance, it was very useful information for us android users. 1. Do not carry out a financial transaction over public Wi-Fi. 2. Make sure your device has a security lock for the lock screen. 3. Disable the property to save your card details when you carry out a financial transaction. If you install Quick Heal on your tablet it will surely ensure better protection. It is a smart investment for data that could potentially cost a lot more. it is safe for android and my laptop & Desktop. thanks alot quicheal to protecting our system from viruses. Thanks for your endorsement and appreciation. Your Samsung phone is supported by the PC2Mobile scan feature. If it still doesn’t work, please contact our support center on 927-22-33-000. Alternately, you can also download Quick Heal Total Security for mobiles on Google Play and install it on your device. With such high-end devices it is highly recommended that you visit Google Play and install Quick Heal Total Security for mobile devices. This application will provide you with round the clock security and effective protection. I am using Sony Xperia Tipo Dual. Is application for same available on Google Play. This Mobile is Not in List of Pc Version. Quick Heal Total Security for mobile is available on Google Play. You can install it on your Sony smartphone from there. I am happily using quick heal total security for past 2 years, no doubt it secures my lappy very efficiently, but it is unable to scan my android phone (micromax a101) this phone model is unavailable in pc to mobile scanner. kindly sort out this issue. Unfortunately, not every device can be included in this list as this requires time and cooperation from the manufacturer as well. However, we can suggest an alternate solution to you. You can install Quick Heal Mobile Security from Google Play to ensure that your device remains protected. How better is Quick Heal than Avast Antivirus in terms of Security on Android? I heard that avast is best for mobile phones, especially for those who download torrents on their mobile phone. Also, it is free. Can you describe, on what basis the Quick Heal Antivirus is better than avast, avg, norton, etc for my android and why should I spend money on it? We prefer not to comment on competitor products and make comparisons. Instead, we can highlight the benefits of our product. With Quick Heal for Android, you will get an application that provides effective virus protection, web security, data protection, anti-theft features, call and SMS filtering and data backup features. Moreover, you will find that the product is fast, smooth and affordable as well. Lastly, our biggest strength is our support and technical assistance and you will find that we are always just a call away. last day when i started my system, QuickHeal started scan and in my D Drive there were two file of 40 GB each with other files. after the scan the two files (40GB size) deleted. why this happened? how can i recovered the files. how can i protect my files from further such actions? Please visit this link to submit a ticket – http://www.quickheal.co.in/submitticket.asp. Our support team will then contact you with a suitable solution. We have received your feedback and will let you know when the device is compatible with PC2Mobile scan. Alternately, if your mobile runs Android OS, you can download our application from Google Play and scan your device with the help of that. My Galaxy note 2 is not seen in mobile security list… please add the same. Since this is a relatively new device it will take some time to get resources from the OEM to develop support. Alternately, you can install Quick Heal Total Security from Google Play and scan your device through the app. Can i scan my Android phone SAMSUNG GALAXY S DUOS (S7562) with quick heal total security installed on my PC. OR suggest some alternate and permanent solution. Kindly visit Google Play on your Android device and search for Quick Heal there. You can install Quick Heal Total Security for your smartphone from there. Yes your devices are safe thanks to Quick Heal security. Can i scan my Nokia 2690 with quick heal antivirus pro on my PC. OR suggest some alternate and permanent solution. The PC2Mobile scan feature is only available with Quick Heal Total Security. You can upgrade to this product from your Antivirus Pro product if you so wish. Unfortunately we do not have this available for Symbian phones. As of now we only support the Android and BlackBerry platforms. I am using sumsang Dual. Is application for same available on Google Play. Yes. If you visit Google Play you will find Quick Heal Total Security for mobile and Quick Heal Mobile Security products. My sony xperia neo l is not seen in mobile security list… please add the same. Kindly get in touch with our support at +91 927-22-33-000. I have sony laptop with legal OS and Legal quik heal total security. now i purchased Samasung glaxy s 7562 moblile but i dont know how to scan it? can u pls assist me? Have you tried contacting our support at 0-927-22-33-000? Kindly visit this page – http://www.quickheal.com/PC2Mobfrm. Here you can raise a request to Quick Heal Support, to provide the PC2Mobile support to your phone. I am using Total Security 2013 on Pc and wish to scan my Samsung Galaxy Note 2 “GT N7100”. As the model is not specifically listed in the list and from the earlier open reply, i have downloaded the Total security from Play Store for my phone, what is the activation process, is my current key of PC quick heal to be used? If you wish to scan your phone through Quick Heal Total Security on your PC, you can raise a request to receive the PC2Mobile Scan service, if the mobile is not mentioned in the list of supported devices. Follow this link for the same – http://www.quickheal.com/pc2mobfrm. For assistance in the activation process, kindly contact our support team at 0-927-22-33-000. They will help you resolve the issue you are facing. I am using QHTS since last 3 years. I want to scan my mobile (SAMSUNG GT s5302). I am not able to find it in the mobile list. can you advise? Thank you for choosing Quick Heal, and your continued patronage. Kindly follow the link given below to place request for the PC2Mobile Scan feature for your mobile device. If you need any further assistance, kindly contact our support team at 0-927-22-33-000. Unfortunately, your particular device is not supported by the PC2Mobile Scan feature at this time. The list of all supported devices is accessible here -> http://www.quickheal.com/pc2mobile. We are constantly adding more devices to this list, so rest assured, your device will be compatible in the near future. Apologies for the inconvenience. I am using Quick Heal Total Security 2012 on my Laptop. I want to scan my Samsung S7562 with this, but this model is not listed in the list provided in QH mobile scan. What should be done to scan my mobile???? Samsung S7562 is launched more than 1.5 year ago. When it will be included in list of QH Total Security 2012? Unfortunately, this device is not supported by Quick Heal PC2Mobile scan right now. In order to provide this feature for phones, we need a lot of cooperation and information from the device manufacturer too. Sadly, for some devices this is not possible. We are working on this issue, and will notify you if there are any developments regarding the same. In the meantime, you can visit Google Play and install Quick Heal Mobile Security or Quick Heal Total Security for Android from there. Apologies for the inconvenience. Unfortunately, right now the only option you have is to install the Quick Heal app from Google Play. You can use the free trial version to clean out your device within the 30 days of the free trial. The link for downloading is as follows – https://play.google.com/store/apps/details?id=com.quickheal.platform. Pls mobile is for(SONY XPERIA U)Quick Heal why is not usb net!!!!!!!!!! Mobile want to is (SONY XPERIA U)Quick Heal ur usb okay????? Pls reply fast comment ok???? Are you referring to the PC2Mobile scan feature of Quick Heal? Unfortunately, not all models can be included in this list because this feature needs cooperation and support from the device manufacturer’s end as well. This is not possible for all the devices available in the market, due to various reasons. We regret the inconvenience caused. i have quickhealtotal security but i cant see my mobile note2 on my pc to scan. will i have to buy quick heal mobile total or note 2 wont even show in that. note 2is quite a popular mobile around from a long time. it should be on the list of total security. Ideally, all mobiles running Android are now allowed for the PC2Mobile scan feature. Are you running the stock Android you received or have you installed some custom ROM on your device after rooting it? We recommend that you contact our technical support center. You can either call them on 0-927-22-33-000 or submit a ticket by visiting this link – http://www.quickheal.co.in/submitticket.